HIV and tuberculosis (TB) are major public health concerns. More significantly, TB is the sole leading cause of mortality among HIV infected subjects across the globe. As we are aware, multi-drug resistant tuberculosis (MDR-TB) is caused by strains of Mycobacterium tuberculosis that are resistant to potent anti-TB drugs, viz. isoniazid and rifampin. Studies in the recent past have shown a mounting trend in the prevalence of MDR-TB among HIV infected individuals. The emergence of a few strains of M. tuberculosis that have developed resistance to an even broader range of anti-TB drugs are referred to as extensively drug-resistant tubercle bacilli (XDR-TB). 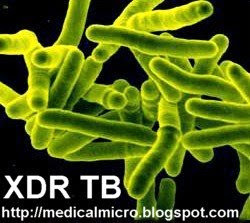 XDR-TB isolates are always resistant to isoniazid and rifampin, and may be resistant in addition to any fluoroquinolone and at least one of three injectable second-line drugs namely, amikacin, kanamycin, or capreomycin [MMWR, 2007]. Even though XDR-TB prevalence is believed to exist across the continents, representative information is available only from a few countries thus far. In the US, 4% of MDR-TB strains isolated between 1993 and 2004 were XDR-TB. Almost 15% of MDR-TB strains isolated in South Korea in 2004 were declared XDR [MMWR, 2006]. Eleven percent (12/113) of the MDR-TB strains isolated in Iran were XDR strains [Masjedi MR, et al., 2006]. In Hong Kong, 12% (9/75) of the MDR-TB strains were extensively resistant. In Europe, representative data is available from Latvia, where 19% of MDR strains isolated in 2000 – 02 were XDR [MMWR, 2006]. In South Africa, 24% of MDR-TB strains isolated were XDR-TB. Out of the 53 XDR patients, 52 died with a median survival time after sputum-smear sample collection of only 16 days [Gandhi NR, et al., 2006]. Detailed information about XDR-TB is still scattered and incomplete due to its fairly recent definition. Scenario of XDR-TB in India: Tip of the ice-berg? It is widely believed that XDR-TB existed in India for long, but is presumed to have been under-recognized and under-treated. India represents nearly one-third of the world’s total TB cases and has the highest incidence of new cases [Mondal R, et al., 2007]. Four percent of the 8.8 million TB cases globally are drug resistant. China harbours the largest number of XDR-TB cases (~13 million), followed by India. Researchers from the Hinduja National Hospital in Mumbai reported that 8% of the MDR-TB cases investigated were XDR. Alarmingly, the mortality rate among the XDR-TB cases in this study was as high as 42% [Udwadia ZF, et al., 2007]. XDR-TB cases would be potently dangerous as the bacilli could easily spread through air. Another recent study from Lucknow reported that 5 (7.4%) of 68 MDR TB strains met criteria for XDR TB [Mondal R, et al., 2007]. A prospective study carried out at AIIMS, Delhi, revealed an alarming 33.3% prevalence of XDR-TB cases, all of whom died within 2.6 months of diagnosis. Preliminary findings from Northern India suggest that XDR-TB is a reality in India [Singh S, et al., 2007]. More nationwide measures need to be ensured to gauge the real status of the XDR-TB threat. The epidemic of XDR-TB among people living with HIV/AIDS (PLWHA) seems to pose a serious challenge. The concern is primarily owing to the underlying risk of rapid disease progression with the additional potential of a high transmission risk. HIV infected individuals are exquisitely sensitive to contracting TB, which can be fatal, unless appropriate anti-tuberculosis drugs are administered promptly. Studies suggest that all persons with HIV should be carefully screened for TB and individuals presenting with TB should be offered a HIV test. To prevent the appearance and spread of drug-resistant TB, the need for bridging the TB and HIV programs is to be underlined. HIV treatment with highly active antiretroviral therapy (HAART) improves the immunity of PLWHA and decreases their likelihood of developing active TB even if they are exposed to TB strains of any kind. Diagnosis of XDR-TB: The need of the hour? Most laboratories in India and other developing countries are not equipped to perform drug susceptibility tests. Laboratory capacity to diagnose, manage and survey Mycobacterial drug resistance need to be strengthened and surveys of drug-resistant TB need to be commenced to determine the extent of XDR-TB epidemic, and its association with HIV. Exactly 125 years after Robert Koch’s discovery of M. tuberculosis, the ‘‘white plague’’ is still affecting mankind. The condition is worse in India, which is engrossed with two interrelated pandemics—HIV and TB. XDR-TB is a wake-up call for fortifying basic tuberculosis and HIV care, prevention and control and to scale up measures to ensure the efficient management of drug resistant tuberculosis. We foresee key contributions from basic science, particularly in the development of newer diagnostic strategies, newer drugs to tackle XDR strains and ultimately, a vaccine to fight tuberculosis.